We all know there’s a lot of good restaurants in Disney World, Florida. And the fact is, it doesn’t matter which restaurant I named, there would be someone who was a big fan of it, and someone else who’d rant about what a waste of space it is. What you really want to know what’s the BEST. What are the top restaurants you should try while at Disney World? Am I right? Now, there are many types of visitors to Disney, and what I would recommend to a family with toddlers and preschoolers VS a family with teens VS a couple on their honeymoon may be very different. But, there are some places that transcend most of those groups and appeal to almost everybody. I rate restaurants on three different areas. The food, the atmosphere, and the “Disney Magic”. I feel all three are important. Food may be good, but if the place has nothing special, no “Disney” touch, I’m not impressed. You can get a great steak in any high-end steak house in America. That’s not why you come here. You should go to the places that are unique to Disney World. That offers either food, atmosphere or experiences that you can’t get anywhere else. So with that in mind, here’s my top choices. ‘Ohana at Polynesian Resort, Dinner: ‘Ohana’s is a family style dinner with Polynesian flavors. I usually describe it as similar to one of those Brazilian steakhouses, in the sense that it’s unlimited food and they bring the meat out on giant skewers that have been grilled on an open flame. Everything is delicious, from the dumplings, wings and lo-mein appetizers, to the shrimp, chicken, and beef, and it’s finished with one of the best desserts on property – Pineapple Bread Pudding with Caramel Banana Foster sauce. It’s to die for. We’ve taken a lot of friends and visitors to ‘Ohana and no one has ever been disappointed. It’s location right on the monorail line across from Magic Kingdom means you can plan to eat here on a day you’ll be visited MK. If you’re around during the fireworks they dim the lights and pipe in the music so you can watch them across the lagoon from the restaurants windows. Prices vary seasonally but dinner will run about $50 a person on average. Be Our Guest – B, L, D: It’s like stepping into the movie. The place is just gorgeous, the food is really great too. I prefer lunch here because it’s cheaper and you can choose which room you want to sit. Try the French Onion Soup, the Croque de Monsieur sandwich (warm ham and cheese on croissant) and the Master’s Cupcake (the Gray Stuff!). Dinner has a more upscale menu that’s quite good. Biggest perk with dinner is you get to meet the Beast and take a picture. While the food is excellent I come here for the atmosphere. If you’re a Beauty and the Beast fan this is a must do. Trattoria al Forno – B: I liked this meal so much I did a full detailed review of it. It just started this spring and has stayed booked solid from what I’ve heard so I guess I’m not the only one who loves it. The characters are Rapunzel, Flynn, Ariel and Eric. They are so much fun to meet an the Food is fantastic. What stands out is the details. Lots of little touches in the food that refers to the two princesses. Definitely makes it more special. Note that only breakfast here is with characters. 1900 Park Faire- B, D: This buffet is better than the average character buffet, wide selection that’s great for ensuring everyone finds something they like. But in general, you don’t go to character meals for the best food at Disney. They’re all about interacting with the characters. If you’re someone who like meeting them, it’s a great way to meet 3,4 at one stop, have a good meal and take some fun photos. What I like most about 1900 is the character choices. Whether you come for breakfast or dinner the characters are unique and often hard to meet in the parks. Breakfast features one of my favs- Mary Poppins, and she’s usually with Alice, Mad Hatter and Pooh Bear. Dinner is with the step sisters with Lady , along with Cinderella and her Prince. The Tremaine’s are so much fun! They interact with guests in the best way and really put on a show. You never know just what they’re going to do but I guarantee it will be entertaining. Cinderella and the prince are also there, and do a dance together. Plus, 1900 Park Faire is at the Grand Floridian in a gorgeously themed venue. All combine to make it one of the best character restaurants. Note: Many will mention Cinderella’s Royal Table in the castle and while it is undoubtedly perfect for Princess fans, and does have a great location inside the castle. But it’s also incredibly expensive. $60-70 a person is pretty steep and the food and experience just isn’t quite that good. But if it really appeals to you I would say it’s great to do one time, so you have that experience. Boma – B: I also did a full review of Boma. I’m not really a huge fan of buffets in general. Many are more about quantity than quality. But Boma is an exception to that. Check out the full article for all the details but the overall the food is great, the atmosphere is enjoyable and it gives you a chance to see one of the more beautiful resorts at Disney. I prefer breakfast here but dinner is also good, it just doesn’t make my personal “best of” list. Via Napoli – L,D: Located in Epcot’s Italy Via Napoli is one of my go-to stops at Epcot. All the food is good but for me it’s all about the pizza. Their crust is like, out of this world good. Everything is fresh and cooked in their giant pizza ovens. My favorite is the Quattro Fromaggi (four cheese) pizza. Can’t say enough good things about it- they’re huge and more expensive than any pizza you’ve probably ever bought and you’ll want to go back again. Note: Second is Blaze Pizza at Disney Springs. While not as good, the $10 price makes it one of the best values. Le Cellier- L, D: This was a tough one. Le Cellier has been in the top food lists for many years. Lately many feel like it’s declined in quality and increased in price. I would agree on that but having gone back this spring to try it again I have to say it’s still excellent. It’s located inside an old castle in Epcot’s Canada. It feels like an old castle wine cellar, very cozy and intimate. The cheese soup and pretzel bread is incredible and any of the steaks are superb. Yachtsman Steakhouse is just as good in terms of food quality, the only thing that gives Le Cellier an advantage is the atmosphere and its location inside World Showcase. But if you can’t get a reservation at Le Cellier you can try Yachtsman as a solid plan B. Tie: These two are so close- food is a little better at Homecoming, but Prime Time has the fun servers and theming. 50’s Prime Time Cafe L, D: I’m from Virginia and we love some good old-fashioned fried chicken and macaroni and cheese. So southern restaurants are always a win with us. Prime Time feels like stepping into a 50’s sitcom show. The servers will fuss at you like family and make you eat your veggies to have dessert. If you like a quiet meal this isn’t it. But they make the meal an experience and it’s unlike anything you’ll see anywhere else. The food is excellent and the PB and J shake is legendary. Homecoming L, D: This is a new restaurant at Disney Springs. Everything I’ve eaten here is good. Seriously. But if you want to be blown away here’s what you do. Get yourself one of the original flavored moonshine drinks from the bar, then order the Fried Chicken dinner. For dessert you must must get the Hummingbird Cake. I don’t care if you’re full and don’t think you can fit it. Order it anyway. You won’t be sorry. While most of Disney World’s restaurants require advanced reservations, (as in 6 months early) you can still get into some great places without that. If you find yourself in this situation try one of these options. 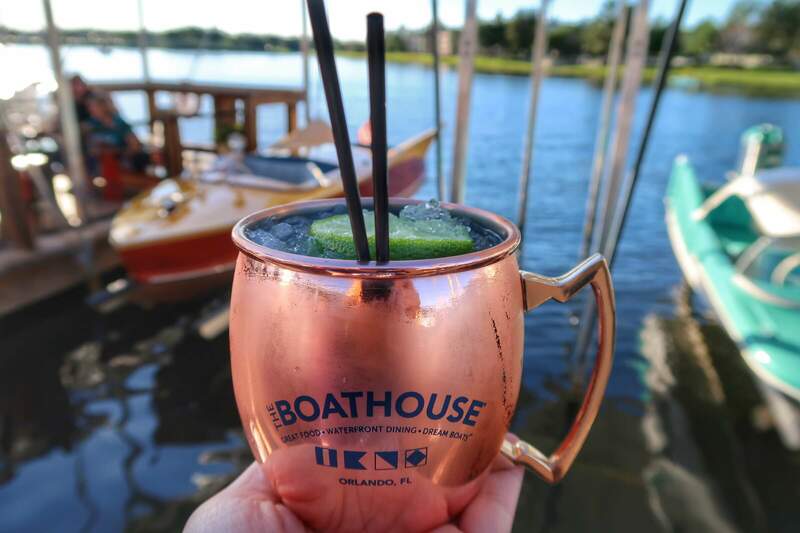 The Boathouse – L,D: The nautical setting at Disney Springs is very classy. The wait staff is superb. Seriously the best I’ve experienced on Disney property. It’s known for its beef (owned by a cattle ranch) so I’d try any of the beef that strikes your fancy. However, I highly recommend either the Triple Cheese Burger or the Filet Sliders and pay the extra to upgrade to truffle fries. A couple bucks well spent. This is a great choice if you have a good size group or family since it has a huge dessert that’s quickly becoming what it’s known for. The S’mores Baked Alaska is not to be believed. It’s $40 and before you say anything- keep in mind that it will feed 6-8 people easily. So split that many ways it’s not bad at all. That cheeseburger with the Baked Alaska and you will leave a happy camper. Rose & Crown – L,D: At Epcot’s UK. They have lots of good things to eat here, but really, just get the Fish and Chips. Trust me on this one. If you like beer they have a great assortment, including a beer flight with seasonal choices. Or you can opt for a Strongbow Cider. Sit outside if it’s nice out and relax. This one flies under the radar. It’s not flashy and it’s been around for ages. But it never disappoints. The food is always good, the beer’s always cold and the staff are always friendly. Kona Cafe – B, L, D: This was my second choice for best breakfast, so if you’re looking for a great breakfast spot you can’t go wrong here. If you come for breakfast I recommend you get the French Press coffee- its strong Kona coffee and so so good. Tonga Toast is legendary and the Pineapple Macadamia Pancakes are my favorite. Sanaa – L,D: Located in the Kidani Animal Kingdom Lodge, Sanaa is a little off the beaten path. That’s the only reason it’s not crazy booked because the food is excellent and the atmosphere is too. Watch the Safari animals graze outside the windows while you eat. (For that reason I recommend you go before dark so you can see them.) The main thing you have to try is the Bread Service. Homemade naan bread with various dips to try. They arrange them from mild to spicy and they’re so so good. I could just eat that bread and be happy. I recommend you share the bread service as your meal – it makes a great lunch. There is one restaurant that tends to be on most people’s top lists that I didn’t include and that is Victoria & Alberts. The reason is that I haven’t been there. It’s the most expensive restaurant at Disney World (and that’s saying something!) very upscale and more designed for adults interested in a romantic gourmet setting. I just haven’t gotten around to trying it but only wanted to include the things I know personally are really good. I can’t vouch for something I haven’t tried. This post will be continually updated to reflect new changes so feel free to bookmark it for your future trip planning. So now I want to hear fromyou. What is your favorite place to eat at Disney World? Did I miss something you feel should be on the list? Leave me a comment and let me know!